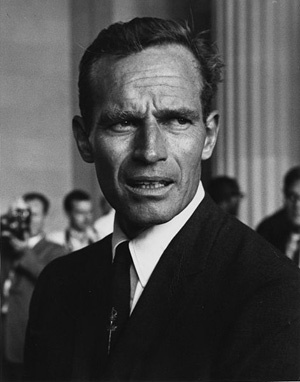 Charlton Heston (1923-2008), American actor and political activist. Heston grew up in Michigan and joined a drama program in high school. He earned a drama scholarship to Northwestern University. After a two-year stint in the Air Force, Heston went back to work as an actor in New York, then in Hollywood. His film break came in 1952 in the film The Greatest Show on Earth, which was named by the Motion Picture Academy as best picture of the year. Heston was known for playing a hero in his films, which included The Ten Commandments, Planet of the Apes, Ben Hur, and El Cid. Heston was politically active, campaigning for John F. Kennedy in 1956, but changing his political party to Republican in the 1980’s. Heston was a gun advocate, and he became president of the National Rife Association (NRA) in 1998. In 1998 Heston was diagnosed with prostate cancer. He underwent radiation treatment, and the cancer went into remission. In 2000 he was treated for alcoholism at a clinic in Utah. Then, in 2002, Heston announced that he had been diagnosed with Alzheimer’s disease. In 2005, it was rumored that Heston had been hospitalized for pneumonia, a common offshoot of Alzheimer’s disease. Pneumonia and dehydration are frequently the apparent causes of death associated with Alzeimer’s disease. Heston passed away from pneumonia in 2008.